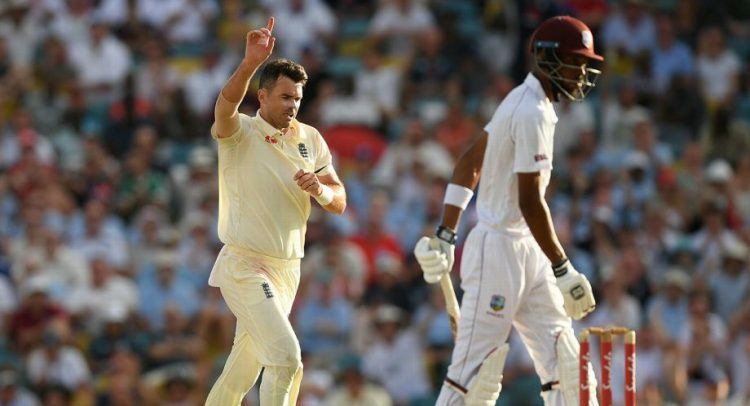 James Anderson broke through with the second new ball to turn the first Test against West Indies in England’s favour on a tough opening day of toil for the fast bowler in Barbados. In the absence of fellow quick Stuart Broad, overlooked as the tourists opted to play two spinners, Anderson’s four scalps took the pair past the 1000-wicket mark between them. Anderson laboured long and hard for his first wicket, and it was a crucial one, breaking a 46-run partnership between Shai Hope and Roston Chase. Bowling his 17th over, he found an inside edge from Hope with a ball that jagged back for a neat caught behind by Ben Foakes. Anderson should have had a second one a short time later when Shimron Hetmyer drove to Jos Buttler, diving to his right and getting his hands to the ball at short cover but failing to hold on to it. It could have proved costly had Anderson not struck late in the day, with Hetmyer going on to reach an unbeaten 56. West Indies captain Jason Holder had repeatedly called on his batsmen to stand up in this match. The issue for the home side could well prove to be that too many faltered after initially heeding his instructions. Three of his batsmen reached half centuries without going on with the job, while two more – debutant John Campbell (44) and Kraigg Brathwaite (40) – fell just short. England took the new ball after 80 overs and Anderson struck almost immediately, tempting Chase (54) with an outside edge collected neatly by Joe Root at slip. Shane Dowrich followed a short time later for a duck but Anderson saved his best for last with a one-handed caught-and-bowled to dispatch Holder cheaply and claim figures of 4 for 33 off 24 overs, half of them maidens. For all the early talk of England’s two spinners versus West Indies’ one and what next for a snubbed Broad, it was allrounder Ben Stokes who ensured England went to tea in better shape than at lunch. Stokes snared the wickets of experienced duo Brathwaite and Darren Bravo shortly before rain forced an early tea with the home side still looking to be in a solid position, thanks to a resilient Hope. Brathwaite, who had played the unlikely role of extra for the first hour as Campbell carved out an eye-catching start, began to look threatening as he picked up his scoring rate immediately after his opening partner’s dismissal. But he managed to add only nine runs after lunch before Stokes struck, enticing an edge which carried to Root at slip. Bravo’s return – he was playing his first Test in two years after the resolution of a dispute with the West Indies board – was short lived. He managed just two runs before Stokes trapped him lbw. Stokes chimed in with the last wicket of the day when he had Kemar Roach caught by Root for no score. England’s selection of a twin spin attack with Moeen Ali and Adil Rashid, in contrast to the home side’s decision to opt for four fast bowlers, bore fruit with Moeen claiming the only wicket of the morning session – that of Campbell, whose rush of blood brought him undone when he attempted to sweep and was hit flush on the back leg for lbw. Moeen and Rashid were selected for a pitch Root admitted he would have batted first on too, had he won the toss, and Broad was edged out by Curran whose batting strength turned the decision. The spinners were expensive though, Moeen conceeding 59 runs from 12 overs while Rashid’s 17 overs cost 56 runs. Curran finished the day with none for 54 from 12 overs. West Indies opted for just one spinner, Chase, in addition to four quick bowlers, which included a recall for Alzarri Joseph after a long-standing back problem.